Thursday June 9th 1898 I was all the forenoon ironing as I seemed to have so many other things to see to. It rained several times today. I practiced a little in the afternoon. Will does not feel very well. Friday June 10th 1898 Will went to town with John Mc--. I was busy about the house all forenoon and with the chickens. I worked in the garden some in the afternoon. Will got home about the middle of the afternoon. I had so much work to do today. Saturday June 11th 1898 Will went to town with Ed Mc-- this morning. I was busy with extra work. I washed a few things. The colt got in the manger and I had to go to Johns for help to get him out. I sewed a little after my dinner work was done. Will and I had a great time with the hens nests after supper. Sunday June 12th 1898 I did not sleep well last night and had an ugly head-ache. Will and I were not away from the place. Karl Bird was here for dinner and John & Callie were us awhile in the afternoon. The boys were both gone. We did evening work and went to bed early. 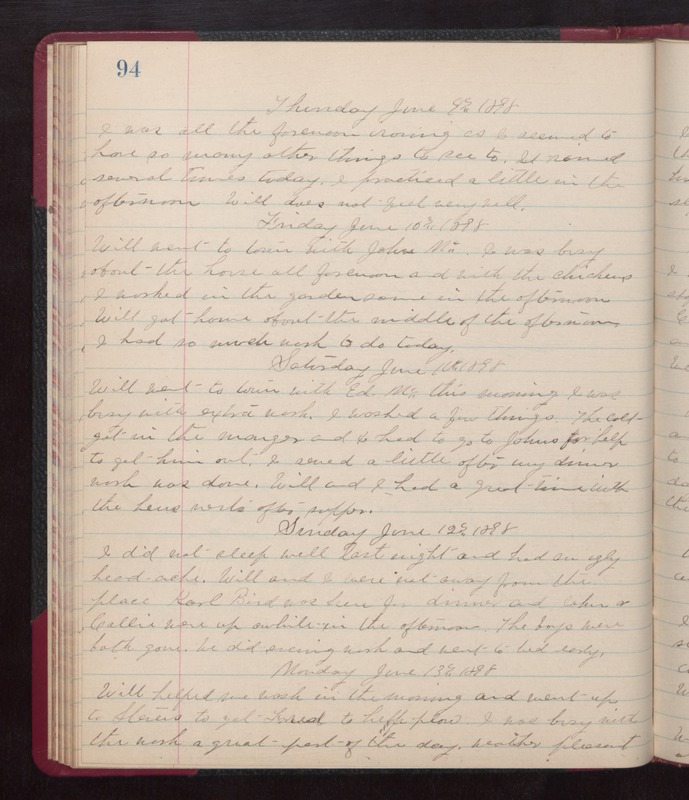 Monday June 13th 1898 Will helped me wash in the morning and went up to Stevens to get Fred to help plow. I was buys with the work a great part of the day. weather pleasant.